The CoffeeShop Blog: CoffeeShop Box-It Storyboard Template! What, another template? Yes! CoffeeShop Box-It is a psd file for Photoshop and Photoshop and has clipping masks (see my tutorial here if you don't know how to use them). 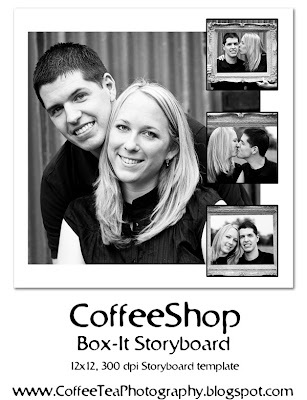 Download the free CoffeeShop Box-It Storyboard template HERE! I believe you are missing a word or 2 in your first line of text? Thanks for this tho, I love reading your blog. Thank you so much! I LOVE your templates and really look forward to them! Your tutorials are also very helpful! Keep up the great work...you are appreciated! Thank you! Your blog post will be advertised on the DigiFree Digital Scrapbooking Freebie search engine today (look for timestamp: 31 Jul [LA 07:00pm, NY 09:00pm] - 01 Aug [UK 02:00am, OZ 12:00pm] ). Thank you so much for this Freebie. I want to let you know that I posted a link to your blog in Creative Busy Hands Scrapbook Freebies Search List, under the Page 12 post on Aug. 01, 2009. Thanks again. Love this one! It will be great for seniors. Thanks again!!!!! Thank you so much -- this is exactly what I have been looking for. You do such amazing work! wonderful wonderful templates~ I am having ap roblem maybe you can help me with it. I have photoshop cs I have downloaded from here before. I am trying to load the actions and I am running into problems. I have a mac so I dl using the 2nd link. I save it to my down loads, go to load actions I then find the action but it is not highlighted one I find them for me to hit load. They are not clickable if that make any sense. Any idea why? Thanks I love you sit! Wow! I just found your blog through another, through another, through another. Funny how one good blog can lead you to another. This one is definitely a KEEPER! I amazed at the stuff here. Ok...I am VERY new to photography and I have NO idea how to use these templates! I have downloaded one and it is open in photoshop on my computer...but I don't know what to do from here!! How do I get pictures in the spaces provided!?!? PLEASE HELP!! !